I can't remember exactly when it was I discovered Red Penny Papers, but I can tell you it's been a welcome source for short fiction from day one. Stories by Aaron Polson, Camille Alexa, Natalie Sin, and others have provided me with no shortage of creepy, fun stories--and all of them for free. The Red Penny Papers fall edition presented five short stories from authors who are all brand new to me. "Arkady's Apprentice" by S.J. Hirrons was a rather stirring tale of magic and legacy with a magician, his apprentice, and his son. The side-note at the end of this story, where Hirrons writing instructors apparently dismissed this story as unpublishable. Whoops. That's some writing school. Next was "So Long, Warren" by Ash Krafton, a devilish mix of noir and the supernatural, which is one of my favorite combinations these days. "Iron Jack" by Mark Rossmore was interesting with its decomposing marriage and the automated servant tearing the couple apart. "Oni wa Soto" by Sara Kate Ellis would probably be classified as my favorite of the bunch. A story about a devil with a crisis at the workplace. The Japanese setting, along with the undercurrent of dark humor, really resonated with me. Good stuff. 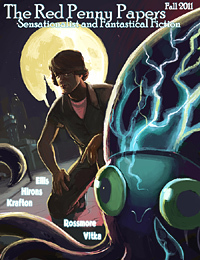 And then "Janitors of the Cosmos" by William Vitka finished off the collection. This one could be classified as the strangest of all five stories, bordering on the surreal, as a "god" exterminator roams the universe hunting down various incarnations of deities who still cling to their would-be worshippers. If you'd like to check these stories out, you find them all on Red Penny Papers' website. I managed to get this in November when Katey the editor pointing me towards an e-book edition--for free! It might still be available, so if you prefer e-books over reading from your web browser, I highly recommend going that route.